A medium roast coffee hits the nose first at a medium high level. It’s not ashy, but full of deep roast character with a touch of burnt. Medium notes of cocoa blends in as well. There’s a low sweetness coming through as well. Not much for hop character. Clean fermentation profile. Very faint hints of blueberry and melon. A deep, very dark brown liquid. Fine and small bubbles composes a tan, almost creamy head. Initially at a 2cm level, it retains with good retention. Some lacing as it’s drank. Clarity is unnoticeable. Medium carbonation that pricks the front of the tongue. The body is initially medium-full, but wanes to a thinner, more watery finish. No astringency. Some oily character to the cheeks on the finish. Slight warming character throughout the mouth on the finish. 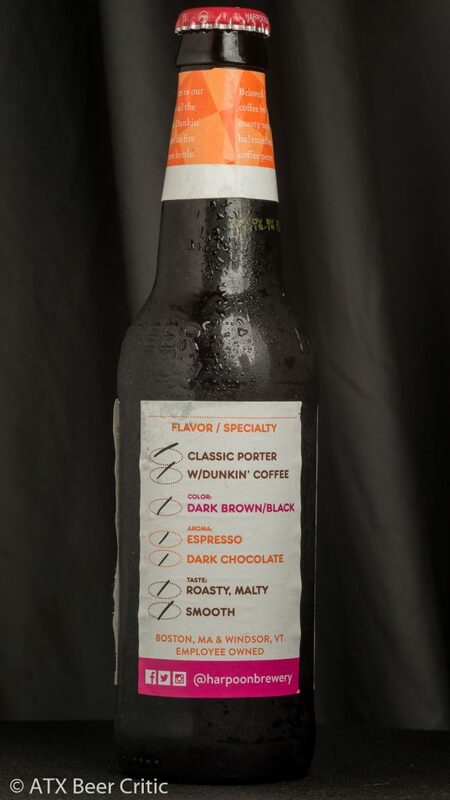 This is a pretty run of the mill coffee porter. The coffee character is nice and not vegetal. The level of sweetness is good, but it almost has an American stout bitterness. Toning down that bitterness a touch would help. I’d also like to see a bit more complexity to the flavors/aromas. A touch of American hop expression would help fit the base style more. 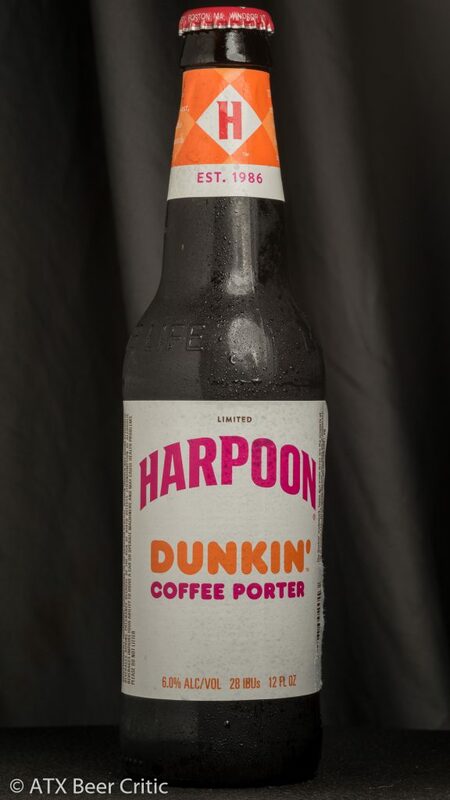 I honestly can’t remember the last time I had a harpoon beer. This one does a good job being a vehicle for Dunkin Coffee. The label art is catchy, and brand cohesive as well. The beer was a bit uninteresting, but would work well if your just looking for a hit of coffee. While it was labeled as 28IBU, I did get a bit more bitterness out of it. Coupled with the dry finish, it was refreshing compared to the sweeter direction a lot of beers are going in these days. 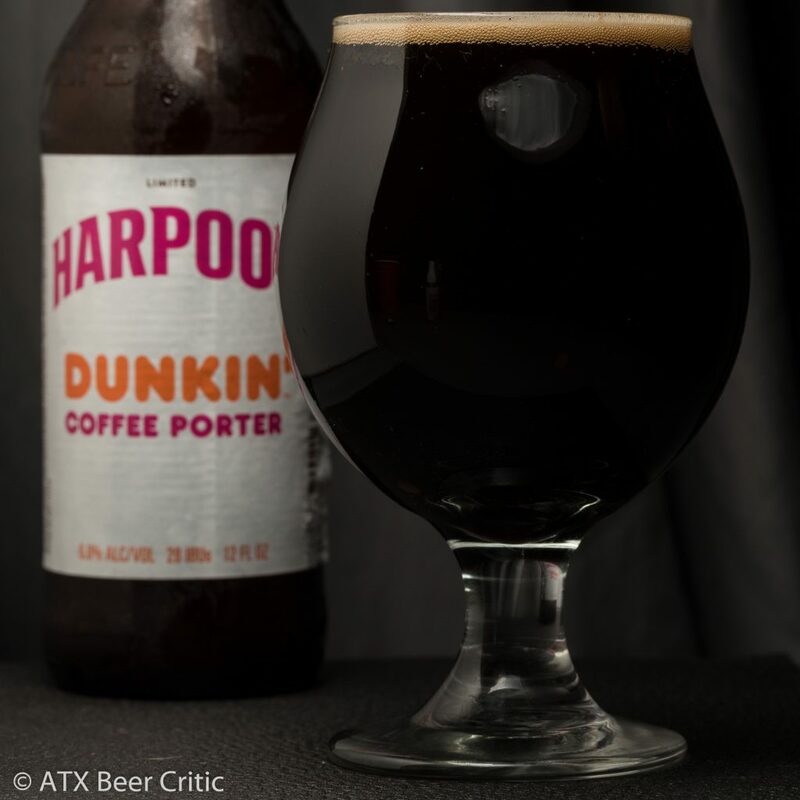 Overall, it’s worth trying, as it is coffee beer season.